Dr Adeel Ahmad is originally from Michigan. He completed his undergraduate studies at the University of Michigan. Thereafter he received his medical degree from the Wayne State University School of Medicine. 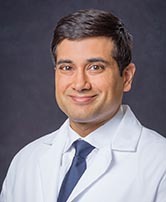 He completed his Physical Medicine and Rehabilitation residency at NYU Langone Medical Center Rusk Institute where he was a unit chief for the Medically Complex and Musculoskeletal Units. He then completed a fellowship in Spine Medicine at the Cleveland Clinic. Dr. Ahmad works in our practice at the Englewood, Fort Lee, West New York offices while also providing rehabilitation care in the Allendale and Pine Valley Centers. His specialty interests include treatment of non-operative spine and musculoskeletal pain as well as electrodiagnostic medicine. He is a diplomate of the American Board of Physical Medicine and Rehabilitation and the American Board of Pain Medicine. Lee TC, Ahmad A, Oh-Park G, Sheehan P. Comparing the Off-loading Effect of two Types of Patellar Tendon-bearing Ankle Foot Orthoses in a Patient with Diabetic Charcot Neuropathy: A Case Report. Annual Assembly: American Academy of Physical Medicine and Rehabilitation. 2006. Campea S, Ahmad A, Fang QG. Referral Patterns and No-show rates to a Physical Medicine and Rehabilitation Electrodiagnostic Laboratory. Annual Assembly: American Academy of Physical Medicine and Rehabilitation. 2006. Ahmad A, Sylvester C. Clinical Experience Review, Annual Meeting: American Acadmey of Child and Adolescent Psychiatry, 2000. Ahmad A, Haftel H. Effect of Educational Program on Intake of Dietary Calcium. The University of Michigan Student Biomedical Research Forum, 1997.